Cooper is loved and owned by Collette Schuller and co-owned by Karen Arbuthnot. I am not sure who adores who more...Cooper adoring Collette or Collette adoring Cooper. As a team they have quite a list of accomplishments. He is well known to those following the sport as an entertainer in the ring....whether he is clowning in obedience or barking at Collette while running an agility course. 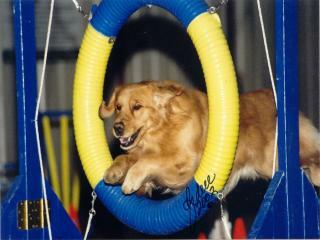 He enjoys himself in all aspects of life, at home with Collette and DJ, or out competing and making new friends. 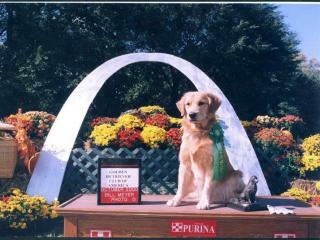 Cooper earned his Tracking title at the age of 14 months at the St. Louis National Specialty (pictured above.) 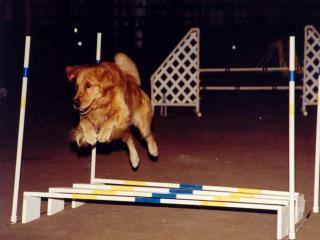 He has 2 championship points from the bred by class (conformation), and also competes in obedience and agility. His many accomplishments have entitled him to earn his VCD2, Versatile Companion Dog 2. To earn this title he had to complete his CDX, OA, OAJ, and TD. Cooper and Collette continue to add to their list of accomplishments, so check back for updates! 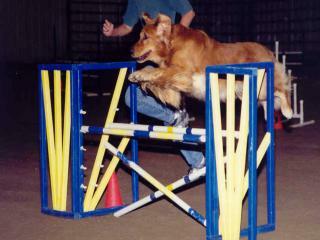 Click here for information on AKC titles and abbreviations.